Le Club Accorhotels has double, triple and quadruple points promotion for stays in Greater China (China, Macau, Hong Kong & Taiwan) between May 1 and June 30, 2014. The bonus points multiplier is dependent on the day of the week (weekday or weekend) and special May Day and Dragon Boat Festival times. Note that you can earn these bonus points only for ONE stay during the offer period. – X3 Le Club Accorhotels points during the Holiday periods (May Day: 1 May to 3 May; Dragon Boat Festival: 31 May to 2 June). Quadruple points combined with the Platinum bonus would mean that you get 20% of the room rate back in points for later use (at the full service properties). Not a bad offer at all if you happen to be in Greater China during the offer period. 1. 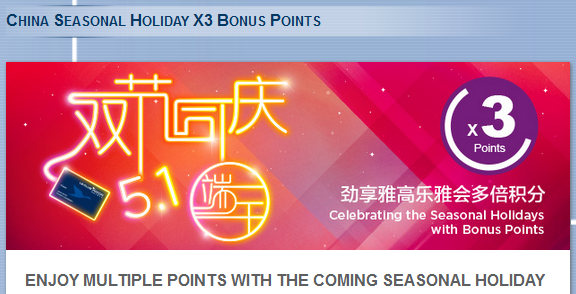 General Le Club Accorhotels terms and conditions apply to the “ China Seasonal Holiday X3 Bonus Points ” offer. 2. This offer is valid for one stay with an arrival date between 18 April 2014 and 30 June 2014 for stays booked between 15 April 2014 and 30 June 2014. 3. This offer entitles Le Club Accorhotels Loyalty members and Accor Advantage Plus members, regardless of their status, to benefit from earning x2 Le Club Accorhotels bonus points on weekdays (Sunday, Monday, Tuesday, Wednesday and Thursday), x3 Le Club Accorhotels bonus points at weekends (Friday and Saturday) and x4 Le Club Accorhotels bonus points during the Holiday periods (Easter Day: 18 to 20 April; May Day: 30 April to 3 May; Dragon Boat Festival: 30 May to 2 June) for one stay at hotels participating in this offer. 4.The offer is valid only once per member during its validity period. 8. Advantage plus members enjoy 10% further discount. 11. Bonus points are calculated according to the points earned by the member based on “”Classic”” status, without point acceleration.